It’s time you learn the secret. Knowing which vacuum cleaner to buy before you even start can save time, hassle and money, not to mention frustration from the purchase of a cleaner that will let you down. The secret is going to be revealed and you’ll never have to wonder which cleaner works for you ever again. The Dirt Devil Versa Power Stick SD20000 is the vacuum cleaner that you need in your life. It took many hours of researching to discover why this cleaner is such an amazing choice, but now the secret is out. Dirt Devil Versa Power Stick SD20000 smooth as silk vacuum cleaner perfect for small areas. There are plenty of reasons to say this vacuum cleaner is one of the best stick vacuum cleaners on the market. First, it offers 15 times more suction power than any other stick vacuum on the market! You heard it right- 15 times more! When it is time to clean the floors powerful suction is what we all want. After all, the better the suction, the more dirt and debris you’ll be removing from your floor. This machine has the suction that you want and need. It features a 10-amp motor. This motor is very powerful, enabling quick clean-up of your bare floor or carpet. Thanks to the 11-inch floor nozzle, you can easily reach underneath furniture and other hard to reach spots without having to move the entire room around or break your back to clean. This nozzle makes it easy to clean and get on to the things that you want to be doing, and as we all know, cleaning is not what you want to do! Although the motor can be a bit loud and noisy, most of the users who purchased the vacuum cleaner were not bothered by this minor inconvenience. When a vacuum cleans as well as the Versa, this is one thing that is easily overlooked. Are There Bags To Change? A transparent dirt cup is offered on the vacuum cleaner. No longer is it necessary to remove the cup every couple of days just to see if it is full. You’ll know when it is time to empty the cup and can do so with just one click. There are no bags to replace or cause a mess inside of your home, another plus that you’ll find with the Dirt Devil Versa Power Stick SD20000. Worried about a big, bulky vacuum cleaner? That is not what you’ll find with the Versa. It is lightweight and compact, making it easy to move from one location to the next. It weighs only 6 pounds! Anyone, even a small child, can carry the Versa around without problems. The machine measures 8x11x38 inches long. It is small and compact as well as lightweight. This feature enables storage to come easily, even if there is not a lot of extra storage space inside of your home. You’ll find an extra-long 20-foot power cord on the Versa. This extra-long power cord makes it easy to clean your floors without stopping. It is long enough to clean even a large room without stopping to find another power outlet. The machine measures 8x11x38 inches long. It is small and compact as well as lightweight. The Dirt Devil Versa offers a 2-year parts and labor warranty. If, for any reason, you are not satisfied with the performance of the vacuum cleaner, or should it malfunction in any way, you are protected for a full two years after your purchase. Ensure that you complete the registration card included in the box so that you can use the warranty should the need arise. Chances are slim that you will need it but it is always better to be safe than sorry later down the line. How Much Does The Dirt Devil Versa Power Stick Cost? The Dirt Devil Versa is reasonably priced to accommodate budgets small and large. One thing that you can always expect is the best price when you shop for your cleaner at Amazon. For next to nothing you can get the secret that cleans floors like no other stick vacuum could dream of! And, with the Dirt Devil name backing the vacuum, you can’t ask for anything more! What Are Others Saying About The Dirt Devil Versa Power Stick SD20000? But don’t just take our word for it. You can find many more reviews of the Dirt Devil Versa by clicking on the link at the bottom of the page. When you click you’ll be taken to Amazon so you can read as many reviews as you would like. Additionally you will find great reviews scattered across the Internet on a number of other websites as well. It seems that everyone loves this tiny little machine. 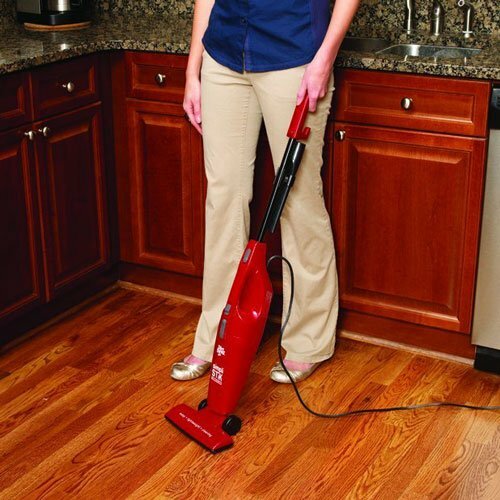 When you purchase the Dirt Devil Versa Power Stick SD20000 you’ll get the stick vacuum cleaner with the 20-foot power card, warranty and product registration card, and an 11-inch floor nozzle attachment. By now you’re surely ready to own a Dirt Devil Versa for yourself, and who can blame you? It’s the vacuum cleaner that will change the way you clean your floors forever! Take a look again at all of the features. These things aren’t available in just any vacuum cleaner that you can buy.When you order with Amazon free shipping is included so there are no extra expenses for you to worry about.